AIG American General companies have been protecting the hopes and dreams of American families for nearly a century. Although the company has retained its Houston base, today it bears little similarity to the simple operation that began with one man’s dream. With more than 4,000 employees and customer service centers across the country to serve their producers and customers, AIG American General insurers now rank among the top insurance providers in North America. The company owes its success over the years to one simple principle – being a loyal partner of American families and the advisor who helps safeguard their security. That’s why its insurers remain committed to maintaining the financial strength that inspires its customers’ confidence. It’s why United States Life provides quality products that help its clients build brighter futures for themselves and the ones they love. And it’s why it never loses sight of the fact that insurance is about people – their welfare, their security, and their dreams for themselves and for future generations. Term life insurance policies offer insurance protection for a specified term or period of time – typically 10, 15, 20 or 30 years. Premiums remain level for a set period, and the insurance is generally less expensive than permanent (cash value) life insurance. At the end of the term period the policy may contain a provision permitting it to be renewed without a medical exam, although the premium rate will be higher. Some term life insurance policies include an option to convert to a permanent life insurance policy. Term life insurance is typically purchased by individuals who need insurance coverage for a temporary period of time (e.g. mortgage coverage) – or who need a large amount of life insurance at the lowest possible cost. Traditional term life insurance provides a death benefit only; the policies do not offer an opportunity to build cash values. A new product concept known as “return of premium term” returns at the end of the level-premium period the amount of the cumulative premiums paid, if the policy is inforce, and in some cases the contract builds cash value. This is an alternative to traditional term life and permanent insurance products. Universal life policies offer the policy owner more flexibility than whole life insurance – the flexibility to choose both the amount of insurance and the premium to be paid with a range of potential premiums. As needs change, the amount of coverage and premium paid may be adjusted subject to certain limitations. Premium payments are credited to a cash value account where the money earns tax-deferred interest at a rate set by the company, which may be higher than the minimum rate guaranteed in the policy. Policy expenses and cost of insurance charges are deducted monthly from this cash value account. Generally, cash values can be accessed by the policy owner through policy loans and withdrawals (charges may apply). 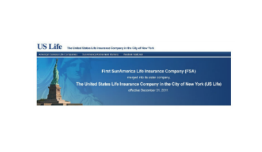 Universal life products may offer a no-lapse guarantee to ensure that coverage will continue from the policy issue date for a specified period of time, as long as the minimum guaranteed premiums are paid. These policies may be maintained with less than the guarantee premium and include a catch-up provision which allows the policy owner to catch up the guaranteed premium at any time if the policy is in force.